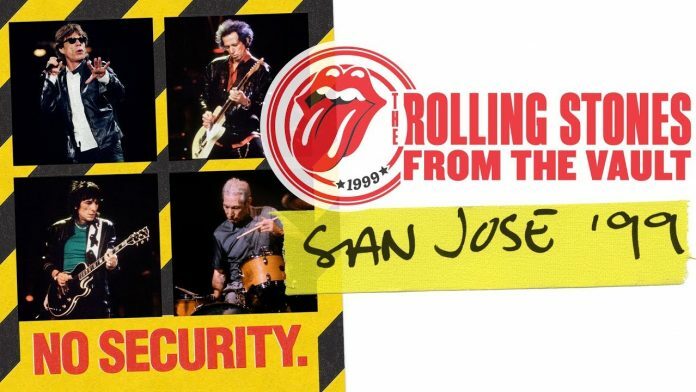 The newest addition to The Rolling Stones’ acclaimed “From The Vault” series looks back on 1999’s No Security Tour with this release from San Jose, California. It will be available on DVD and SD Blu-ray (both accompanied by 2 CDs with the audio from the show) as well as on triple vinyl on July 13, 2018. The Rolling Stones’ No Security tour ran from January to June 1999 through North America and Europe. It followed on from the colossal Bridges To Babylon tour and took its name from the “No Security” live album recorded on that 1997/98 tour. In reaction to the huge stadiums played on Bridges To Babylon the conscious decision was made to book smaller venues for the initial North American leg of the No Security tour. This show was filmed at the San Jose Arena in front of an audience of a little over 30,000 (intimate by Rolling Stones standards!) at the end of the North American run. Previously unreleased, it captures the band in top form playing a set that spans from mid-sixties hit singles up to the then current Bridges To Babylon album. The set list spans from the mid-sixties hit singles to the Bridges to Babylon album, including a bluesy, dramatic version of ‘Midnight Rambler’, a dark and swaggering ‘Out of Control’, and the rarely performed live, ‘Some Girls’ and ‘Saint of Me’. The show was an electrifying, anthem-packed, cross generational hot ticket, concluding yet another chapter from the band that wrote the book on rock ‘n’ roll.